Who was the 'progressive': free trade MacDonald or protectionist Baldwin? Anti-Conservative prejudice is nothing new in British politics, though it has to be one of its odder characteristics. It continues to colour the judgement of certain people, for example, to the extent that they revolt violently over Tory policies that are near identical to those they acquiesced under Labour (NHS reform, tuition fees, top-up fees etc). And, yesterday, Chris Huhne joined with lefty trolls Caroline Lucas and John Denham to urge voters to rig the electoral system against the Conservatives, on the basis that they have never polled more than 50% of the vote in any of the twentieth century's general elections bar two - 1900 and 1931 - and that therefore the majority who didn't vote for them ought to be the ones forming a government. Their claim about this lack of majority support is, of course, correct but they omit to mention that the Conservatives are the only party ever to have polled 50% of the vote in the twentieth century (and in 1935 and 1955 they still polled more than Labour and the Liberals combined). Even in 1945, Clement Attlee only managed 49.7% - meaning, by Huhne's own logic, there was a majority in the country against Labour's 'cradle to grave' welfare state, NHS and mass nationalisation and that it ought never to have taken place. Their assertion, too, that 'the Conservatives have dominated our politics for two-thirds of the time since 1900' is on shaky ground. That the party has spent only 49 of those 110 years in government appears to have completely eluded them - as in any healthy democracy, the tables in fact turned a great many times. The first ten years, for example, were still very much in the shadow of the Liberals' welfare reforms, while the decade following the Great War saw the reins of government swapping with each election between blue and red. 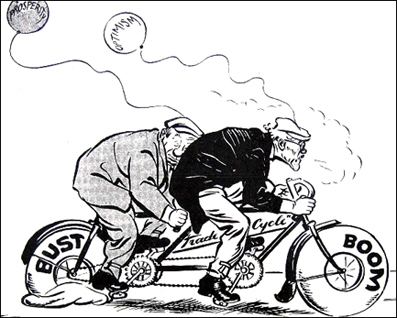 This itself was followed by a long period of three-party coalitions stretching to 1945. Then, of course, the following three decades were wholly dominated by Attlee's landslide Labour victory. The Conservatives not only declined to reverse the Attlee reforms but swallowed the new consensus whole - adjusting their public spending commitments accordingly. Indeed, the only period one could credibly claim as Tory-dominated was the Thatcher consensus after 1979. But of course, Huhne, Lucas and Denham are not talking about Labour or the Liberals respectively - it's far more convenient for them to speak in terms of an imaginary 'progressive majority' between those parties, the nationalists and the Greens. Indeed, their entire argument rests on the seriously flawed assumption that - despite the coalition serving evidence to the contrary - Tories are irreconcilably different from all other parties and that Labour are the Liberals' natural partners. But this beggars the question as to why, if they are so similar, they have not worked together more often in the past and why, on the occasions in which they have (March 1977 to June 1978 for example), the relationship has broken down so quickly. Furthermore, why did one half of what is now the Liberal Democrat party (the SDP) split from Labour in the first place? And why have none of them ever gone back? The whole thing rather flies in the face of Charles Kennedy's rhetoric early in the last decade that the Lib Dems were neither to the left nor the right of the political spectrum - that they opposed much of both Labour and Conservative policy because of the uniqueness of their ideological viewpoint. It also ignores the fact, highlighted by Tim Montgomerie, that a substantial number of Lib Dems, when pressed, see themselves as closer to the Conservatives than Labour, particularly in the south. Hence, of course, why a coalition deal with the Conservatives was so relatively easy to hammer out. Both parties found strong common ground on the issues of civil liberties, choice in public services, localism and reducing bureaucracy - all things Labour had comprehensibly failed to deliver - while the Lib Dem policy of increasing the income tax threshold to £10,000 proved extremely popular with the Tory grassroots. But this all really boils down to the question of what 'progressive' actually means. For example, it's not entirely clear - given modern attitudes to the subject - who was being 'progressive' on the issue of free trade in the 1920s and '30s; Labour and the Liberals for supporting it or the Conservatives for opposing it? And were the Conservatives being 'regressive' when, with a 103-seat majority, they extended the vote to all women in 1928? Or, indeed, a large swathe of the working class in 1867? (Huhne does, but that's because he doesn't believe these things actually happened). No, the root of the matter is statism, pure and simple. The lowest common denominator binding Labour, anti-Union nationalists, loopy Greens (who want to stop you going abroad on holiday by the way) and some Lib Dems is higher and higher state spending. Meaning, of course, that they are all in favour of higher taxes and/or more public borrowing (though the latter, as we are seeing, inevitably leads to the former). It is for this reason that the Conservatives will never go away and, despite the best hopes of these doppelgänger democrats, will never be permanently excluded from government. In the end the issue is, indeed, the economy, stupid and - even in 1997 - there is ample evidence to suggest voters wanted Conservative policies - sound economic management, prudence, a tough line on law & order - without the Conservatives, whom they had come to despise for their hubris and 'sleaze'. But, in the 88 years since their first government, Labour have yet to prove their economic competence and have managed to consistently leave office with unemployment higher than they found it. The voters know this and, I can guarantee, a lot of Lib Dems know it too. And I wager it's the reason Germany - which has one of the most representative voting systems in the world - has had more conservative-led coalitions than any other.